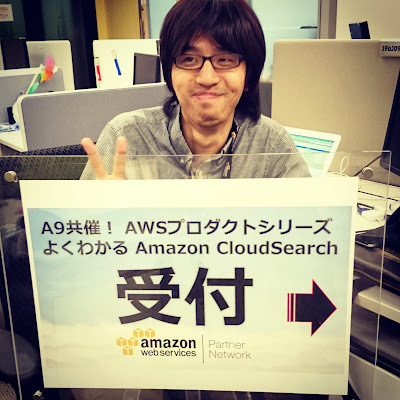 CloudSearch Team came to Tokyo in May 2014 and then we had Amazon CloudSearch meetup. Rob introduced A9(Amazon’s subsidiary. Developing Amazon Product Search, Visual Search, and CloudSearch). He stressed that Japan market is important and commitment to Japan is strong. Rob also introduced global CloudSearch use-cases. And, thanks Ryoichi(@ryo1kato) for translating! I talked CloudSearch detailed things. I introduced latest CloudSearch updates like CloudTrail support, Bigram Indexing, and Customising Japanese Tokenization. I’m going to update following slides and upload it later. ChatWork is using CloudSearch heavily. One of the biggest use-case in Japan. Developer Tanaka-san introduced the way to move to CloudSearch. As you can see following slide, their data is huge but CloudSearch handles that with low-latency 🙂 Managed service is beneficial that they don’t need to think of operation and maintenance. nanapi is popular life recipe site in Japan. They are using CloudSearch simply but effectively. schoo is life long learning platform. There are AWS classes in schoo! Ito-san heard that CloudSearch is nice to use at 『CTO Night with Amazon CTO Werner Vogels』 in July 2014 at Amazon Meguro Office. Then, Ito-san and schoo developers introduced CloudSearch very quickly(about only one week!!). Kaneyama-san is the top-notch Japanese search engineer works at Cookpad(most popular recipe service in Japan). He introduced Black Belt tips for improving search. Thanks you for helping me to organize this event Sakatoku-san and Hoshino-san!